I have friends from Augusta, Georgia visiting this Labor Day Weekend, so I've been showing them around Charlotte. Yesterday, we spent the day outdoors, first hitting up the Charlotte Literary Festival in NoDa (it's also taking place today 10 a.m.-7 p.m.), then we headed downtown because I wanted them to see what it was like and we stumbled upon the Festival of India that was taking place along Tryon Street in front of the Blumenthal. If you haven't known, Charlotte is a great city with a lot to offer and there's always something to do (contrary to what some may think). In showing my friends around, I got to act sort of as a tourist guide and remind myself of why I love living here. 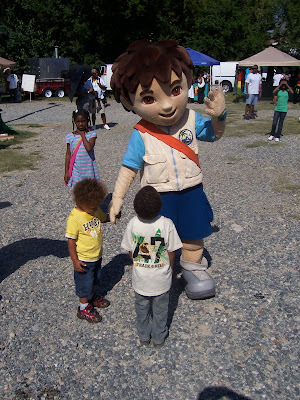 Diego, of Dora the Explorer fame, shows love to the kids at the Charlotte Literary Festival. 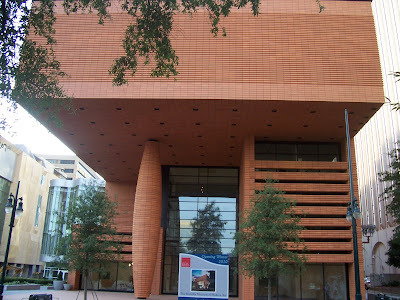 The Bechtler Museum of Modern Art is set to open in January at the Wells Fargo Cultural Campus. It's now one of the most beautiful buildings downtown. 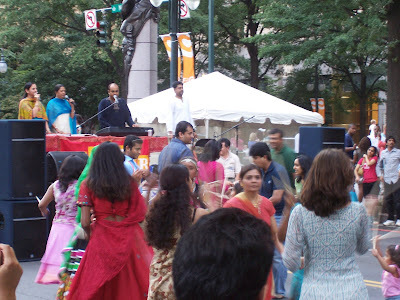 The Festival of India drew hundreds of people with music, dance, food, and vendors selling authentic clothing and art.